A fine pianist/keyboards and vocalist in the jazz and popular styles, Jeff can provide just the right music entertainment for your function, club or restaurant performing many of the hits from the great artists such as Robbie Williams, Michael Buble, Harry Connick Jnr., Georgie Fame, Dianna Krall, Nat King Cole, Frank Sinatra, Billy Joel and Elton John, or playing piano in a style reminiscent of Oscar Peterson andBill Evans. Jeff has performed in many of Sydney's top five star hotels as a lounge bar pianist, and as a one man band artist or bandleader in many clubs, fine restaurants and function rooms. 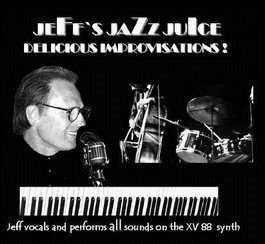 Jeff's enormous repertoire, great keyboard stage sounds and his sensitivity and responsiveness to his audience ensure a superbly successful occassion. Contact Jeff for your CD copies and availability.